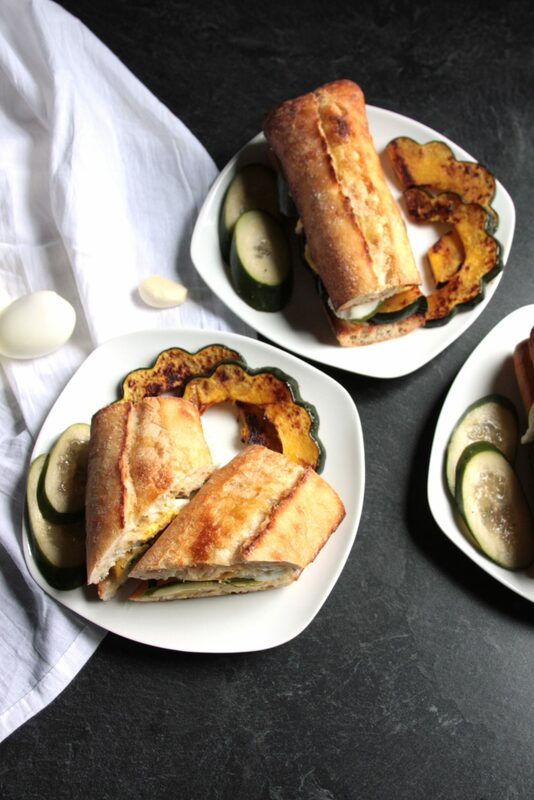 These sandwiches kind of have a lot of backstory, so get ready! First and foremost, They are ridiculously delicious. 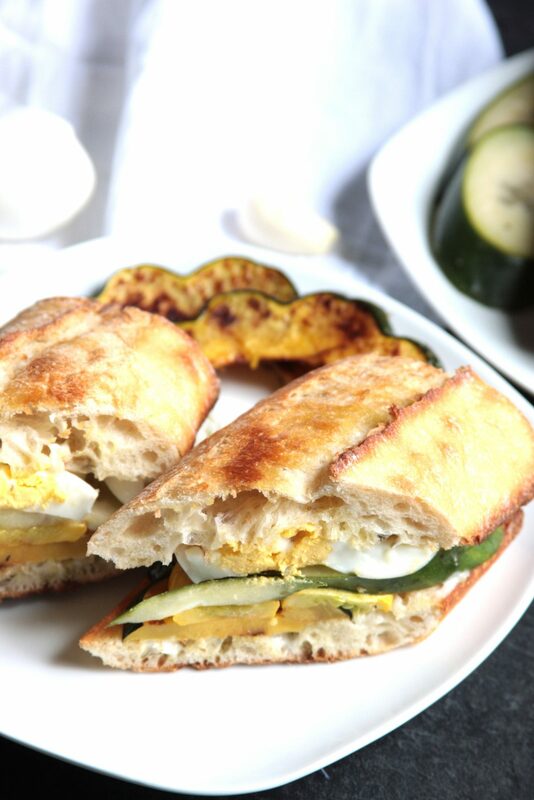 You may be thinking, “Cucumber and zucchini sandwiches? That does not sound very enticing.” because that’s exactly what we said when we first saw the recipe. This is definitely a case of don’t judge a book by it’s cover. Especially for a meat-head like my husband, it can be hard to get excited about an all veggie sandwich. We’ve made these sandwiches probably half a dozen times already in the last few months though, and have made them several times for our game night crew because everyone loves them so much, meat-head or not. It’s unbelievable how flavorful they are. You really must try them. 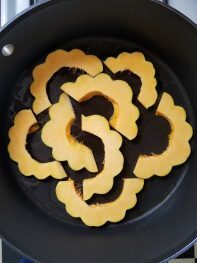 How did we come across this recipe? It was actually the very first recipe we made when we started Blue Apron back in August of 2016. We gave Blue Apron a shot because our friends had signed up for it and seemed to like it. We thought it’d be a great way to try out new recipes, learn about and try ingredients we weren’t familiar with, and hopefully gain a new recipe here and there to add to our recurring recipe arsenal. We knew we were going to be getting recipes for things we weren’t familiar with, so we decided ahead of time we’d stick to the recipes and give them a shot, as written, without altering anything or leaving ingredients out that we thought we wouldn’t like. Man, am I glad we did! If I had stuck up my nose and said “Well I don’t like this and that, so we’re just going to leave those things out” I would have missed out on so many delicious flavor combos. A perfect example is in this sandwich recipe. It calls for capers mixed into the mayonnaise. I really hate capers…well…at least I thought I did. Every time I’ve had capers on chicken piccata or anything else, I’ve hated the dish. Their flavor is just not for me. Then this sandwich came along and I thought for sure I’d hate it just like everything else, but something magical happened. The flavor of the capers transforms into something amazing in combination with everything else in this recipe. It is so…flippin’…good. I still cringe a little every time I have to chop them up for this recipe, but I do it anyway because it is so worth it. I strongly recommend giving this recipe a try, even if some of the ingredients are things you don’t normally enjoy. We get our Blue Apron delivered once a month on Friday and we’re on the 2 person, 3 recipe plan. We’re able to select what day of the week it will be delivered, swap out recipes ahead of time if there’s something we really don’t want, and skip weeks if we know we won’t be around to make the recipes on a given weekend. We’re only charged for the meals we get. There is no additional fee, even if we skip our deliveries for weeks at a time. I think the most surprising thing I’ve enjoyed about Blue Apron, is how much more comfortable I’ve become with different cooking techniques in general. Even though we only get our delivery once a month, I’ve become more familiar with recurring methods and find myself much more comfortable experimenting with my own recipes because of it. I used to think of myself as the “baker” and my husband as the “cooker”. While I’m still definitely the baker of the household, ;P I’m so much more comfortable and excited about making non-baked goods now, and I think that is in large part due to Blue Apron. If you have any questions about Blue Apron, send them my way! I’d be happy to give you my input. If you want to try it out for yourself to see how you like it, here is a coupon for 3 Meals Free on Your First Blue Apron Order. Back to the sandwiches. Blue Apron’s version of this recipe is called “Pan-Bagnat Style Sandwiches”. After we’d made them for about the fourth time, I finally started to wonder what the heck a “Pan-Bagnat” was. So I did a little research. Pan Bagnat sandwiches originated in the South of France and translates as bathed bread or wet bread. It is meant to rest a while before being served so the bread will absorb, or be “bathed” in, all of the flavors and ingredients. The ingredients normally consist of those found in a nicoise salad: fish, hard boiled eggs and vegetables with a drizzle of olive oil. The sandwich is then tightly wrapped until it is time to serve. Because a pan bagnat is wrapped up and severed up to several hours later, it is ideal for picnics or on-the-go lunches. Now that Spring has officially arrived, picnic season is just about here as well. 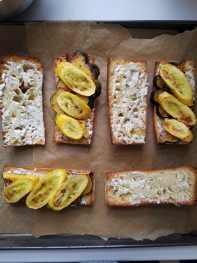 Grab this recipe, pack up your sandwiches and enjoy them al fresco! 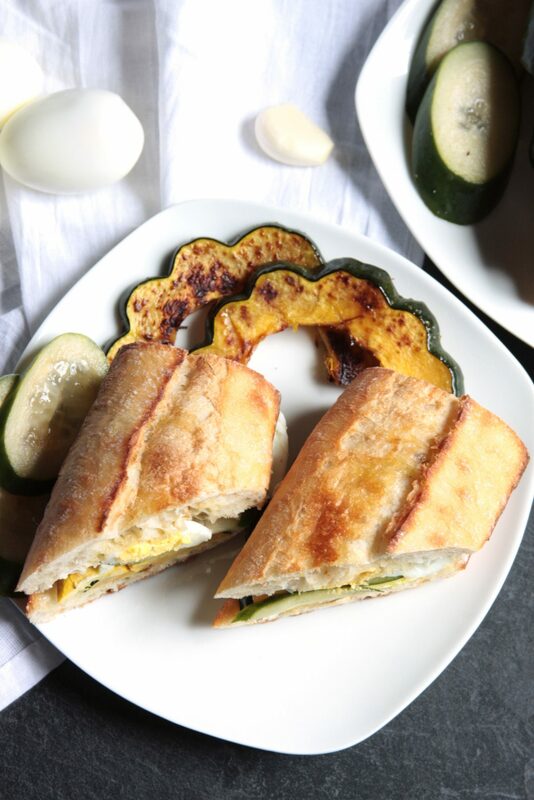 This pan bagnat inspired sandwich is meant to be prepared ahead of time and served at room temperature so it is perfect for picnic gatherings or just an on-the-go lunch. Though full of veggies, even the meat heads in our group adore the flavor combination this sandwich offers. 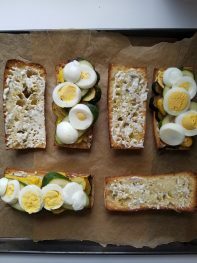 So much more than you might expect from a cucumber sandwich! 3 eggs hard boiled* and peeled. 1/2 cup mayonnaise 4 oz. 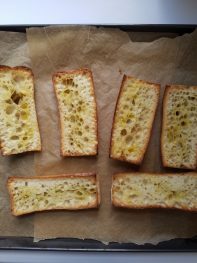 1 loaf ciabatta lunga or any bread that has a very crunchy exterior with a soft interior. You'll need enough for three 6 to 8 inch sandwiches. 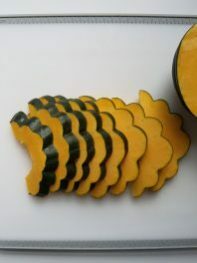 1 acorn squash small, cut into 1/8 inch slices. You'll likely have extra. 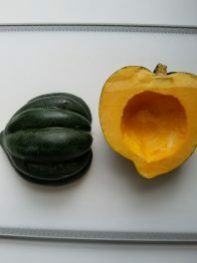 Patty pan squash is ideal but is not regularly available. 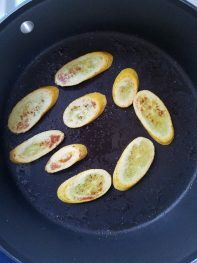 1 zucchini sliced into thin, 1/8 inch slices. olive oil for toasting bread and cooking squash and zucchini. Preheat oven to 450 degrees and prepare hard boiled eggs. See recipe notes section for link to hard boiled egg instructions. Slice the hard boiled eggs into thin rounds. I usually cut each into 5-6 slices. 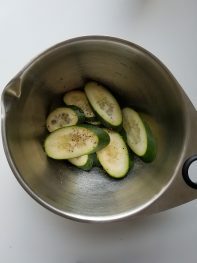 In a small bowl, combine sliced cucumbers, vinegar and salt and pepper to taste. Stir to coat and let marinade while you prepare the rest of the sandwiches. Stir every 10 minutes or so. In another small bowl, combine mayonnaise and chopped capers. Set aside. Slice the ciabatta loaf into 3 equal sections, then half each sandwich lengthwise. Place all halves, face side up on a baking sheet and lightly drizzle with olive oil. Bake for about 8 minutes or until the edges just begin to brown. When cool enough to handle, rub the cut sides of the buns with the garlic clove. 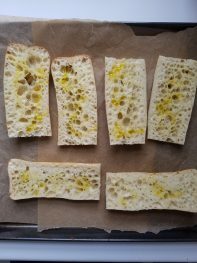 While the bread toasts, heat 2 teaspoons of olive oil on medium-high heat in a large pan, the larger the better so you can get everything cooked in as few rounds as possible. I generally have to do two rounds of squash and one round of zucchini. 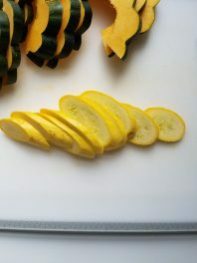 When the oil is hot, add the squash in a single layer and cook on each side for 3-4 minutes or until browned. Season with salt and pepper and transfer to a plate. 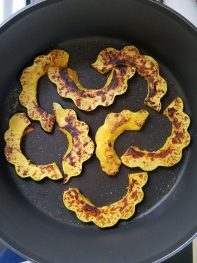 Repeat with remaining squash and zucchini. Spread the mayonnaise on the cut sides of the bread. 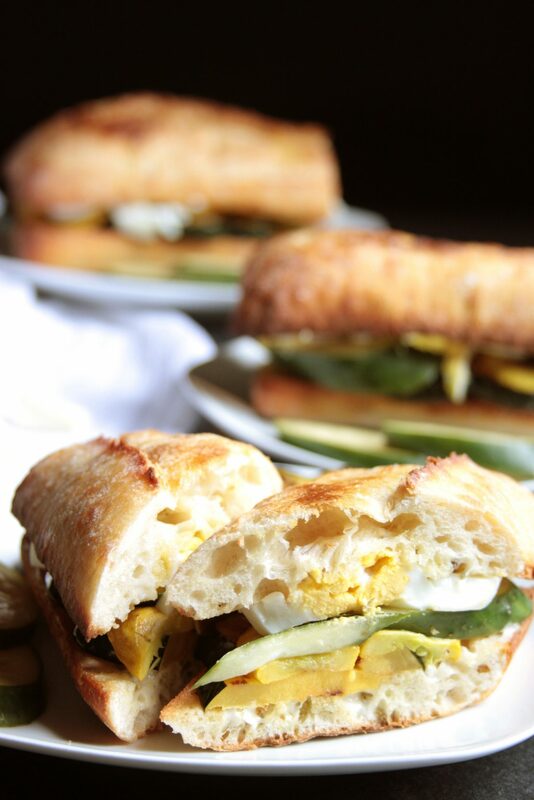 On the bottom halves, layer the squash, zucchini, cucumber and egg. Add the top halves of bread, and press each sandwich down firmly to mingle all of the ingredients and make the sandwich more stable if you plan to serve them immediately. Otherwise, tightly wrap each sandwich in tin foil, or plastic wrap and serve after a few hours. You can also and place a heavy pot or pan on them to compress them for about 10-20 minutes to further mingle the bread with the flavors. *See my hard boiled egg recipe for tips on how to get perfectly boiled, easy to peel eggs every time. Have you tried any other meal delivery services? What did you like best about them? Do you have any fun outdoor adventures planned for the near future where you need to bring a meal with? Comment below!